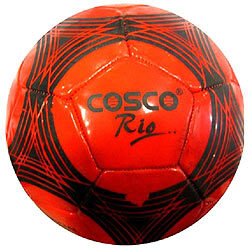 Let others feel happy as you deliver them this Fashionable Cosco Football Rio (No. 3) with your love and affection. This machine stitched Football is made of polyvinyl chloride cover which makes it durable and its nylon winding and butyl bladder help retaining its shape for long time while long practice session.